A highlight of the 2016 Morningstar ETF Conference was the keynote address by the former leader of U.S. Navy Seal Team Six, Rob O’Neill. Chief O’Neill shared some stories about his training and operations as an elite Navy Seal. The take away lessons from his talk were the importance of preparation, discipline, and keeping the mission goal in mind. Overriding all this is the importance of tenacity. A Navy Seal survives eight months of insanely intense training by advancing one hour at a time without ever giving up. Another speaker at the event, Jason Hsu, showed that many professional investors do poorly because they lack this tenacity. They are instead influenced like the public by short term cyclical performance swings..
Investors often select investment managers or approaches based on 3 to 5 years of past performance. But 3 to 5 years is mean reverting with both markets and managers. Fired managers on average do 250 bps better than the new ones taking their place. Most investors, both professional and public, tend to be market timers whether they know it or not. And they are poor ones at that. What we should do, according to Hsu, is stick with our long term goals and ignore shorter term cyclical performance swings. In other words, investors would do well to follow Chief O’Neill’s advice – prepare well, and stick to your plan with discipline and determination. To proceed with confidence, we need to have a good understanding of the investment factors we are using. There has been abundant academic research on factors, beginning in the early 1990s with size and value. Factors in general have shown favorable results on paper. But now that factor-based investing has been around for a while, it might be useful to look at how factors have done on a real-time basis. McLean and Pontiff (2015) looked at 97 factors from academic literature that predicted cross-sectional stock returns. They found that factor returns were 58% lower following their publication. Calluzo, Moneta, and Topaloglu (2016) looked at 14 well-documented anomalies from 1982 through 2014. They included value, momentum, profitability, and investment. These authors found a 32% decay in average factor returns post-publication. Yet factor based investing has been growing in popularity. The emphasis of the Morningstar ETF Conference was factor investing, and Conference sponsors were busy promoting factor-based ETF products. The Conference set the tone for this with an early talk by Ronen Israel of AQR that featured the two most popular factors, value and momentum. Israel pointed out momentum’s tax efficiency and how it can help offset value traps in a diversified value and momentum portfolio. One of the issues associated with stock momentum is price impact due to scalability limits. Momentum performs substantially better with focused portfolios of 100 or fewer stocks and with frequent rebalancing. Unlike value, momentum is a high turnover strategy. If you turn over 30% of a 100 stock momentum portfolio each quarter, it does not take many billions of dollars to have a substantial impact on price. Momentum stocks are also volatile with wide bid-ask spreads. This volatility contributes to their higher transaction costs. Israel pointed out a study by Lesmond et al (2004) in which transaction costs completely offset the profits of momentum investing. Israel then pointed to a proprietary 15-year data set showing momentum portfolios earning decent profits at the cost of more tracking error. A recent study by Fisher, Shah,and Titman (2015) using observed momentum stock bid-ask spreads found transaction costs to be higher than Israel’s figures and closer to Lesmond’s. Let us take a look at the performance of two of the oldest momentum funds. They are the PowerShares DWA Momentum ETF (PDP) that began in March 2007 and the AQR U.S. Large Cap Momentum Style Fund (AMOMX) that started in July 2009. Both funds have underperformed their Morningstar designated benchmarks from their beginnings until now. This is too short a history to rely upon. But it is consistent with the study by Bhattacharya, Li, and Sonaer (2015) showing insignificant stock momentum profits since 1999. Hwang and Rubesam (2013) show that the momentum premium of stocks disappeared in the early 1990s. Let us move on to value, which is the most popular investment factor. Of the 8000 or so U.S. mutual funds, more than 1000 are value funds. Value is the only factor that appears in every multi-factor ETF. Israel showed that value is best determined using a combination of multiple valuation methods. All metrics performed about the same over the long run, but performance varies considerably over time. Of five different value metrics, earnings-to-price (E/P) was best overall, but it was the top metric in only 2 out of 6 decades. The value premium has been insignificant among U.S. large cap stocks . But Israel pointed out that value can still be useful when combined with momentum. According to Israel, value should make up one-third of a combined value and momentum portfolio, even if value has zero expected return. This is because value can reduce the volatility and tracking error of a momentum portfolio. But diversification this way can create considerable performance drag. In our Morningstar Conference breakout session on momentum, Wes Gray, Meb Faber, and I described how trend following could create a reduction in risk exposure without this kind of performance drag. As we did with momentum, let us see now how value funds have performed real time. Using the CRSP database, Loughran and Houge (2006) looked at the performance of U.S. equity funds from 1962 through 2001. They used the prior 36 months to sort funds by style (top versus bottom quartile) and size (top versus bottom half). From 1965 through 2001, the average large cap growth fund returned 11.3% annually, while the average large cap value fund returned 11.41%. The outperformance of 0.11% for value over growth was insignificant. In addition, there can be horrendous tracking error associated with value investing. 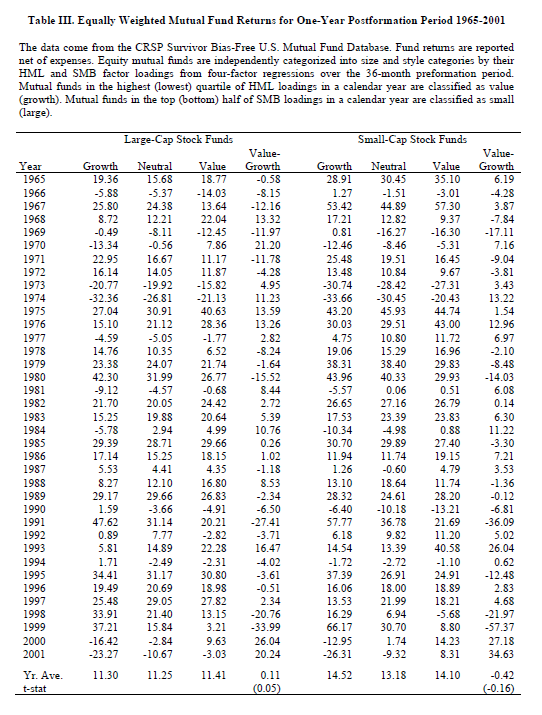 From January 1929 through June 1932, small cap value underperformed the market for 42 consecutive months. More recently, small cap value underperformed for 26 consecutive months from July 1989 through April 1981 and for 21 consecutive months from May 2014 through February 2016. I can't imagine many investors who would be willing to endure this. Most everyone likes the idea of value investing. We are used to finding bargains and buying what is cheap. But value stocks may look cheap for a reason. Serious tracking error and lower than expected real time returns are additional risk factors that make them less appealing. Perhaps Fama and French were on to something when they omitted momentum and made value redundant in their latest factor pricing model. The Capital Asset Pricing Model (CAPM), Mean-Variance Optimization (MVO), and Portfolio Insurance were all elegant academic concepts that looked great on paper, but never held up in the real world. Maybe factor-based stock investing will suffer the same fate. As Benoit Mandelbrot once said, "Many a grand theory has died under the onslaught of real data." The median expense ratio for growth funds was 11 basis points higher than for value funds. Since growth funds also realized slightly higher average returns, expense ratios cannot explain the absence of a value premium across mutual fund styles.